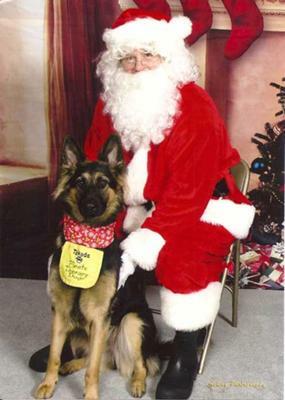 Takoda Blaze is my 16 month old German Shepherd. Takoda is Sioux Indian for "friend to everyone" and Blaze is a German version of "blaz" which means "un-waivering protector". When we got "Koda" I was looking for a dog that would be a therapy dog as well as a loyal, protective friend. I am a mental health therapist and Koda comes to work with me about 3 days a week to be available to my clients who would like to spend time with her. In fact, I have clients who give Koda Christmas presents and send her emails telling them what is on their mind and gaining comfort from her. My co-workers also find her to be very therapeutic as they are always happy to see her cheerful and happy face. Koda has brought so much joy to me and my family's life as well as my clients and my colleagues. I have posted a few of her pictures here. I hope you enjoy them! pretty dog, i wish some day to have my own german sheperd.